Barcelona is a fantastic urban destination, with so much to see and do. But if you limit yourself to staying within the city, you’re missing a lot of what Catalonia has to offer. Within a couple of hours of Barcelona city, there is a myriad of seaside villages, pretty hillside hamlets, stunning secret beaches, beautiful historical towns, cultural and natural attractions, and even giant theme parks! The list goes on. So schedule in a few extra days and get planning with my guide to the best day trips in Barcelona Spain! 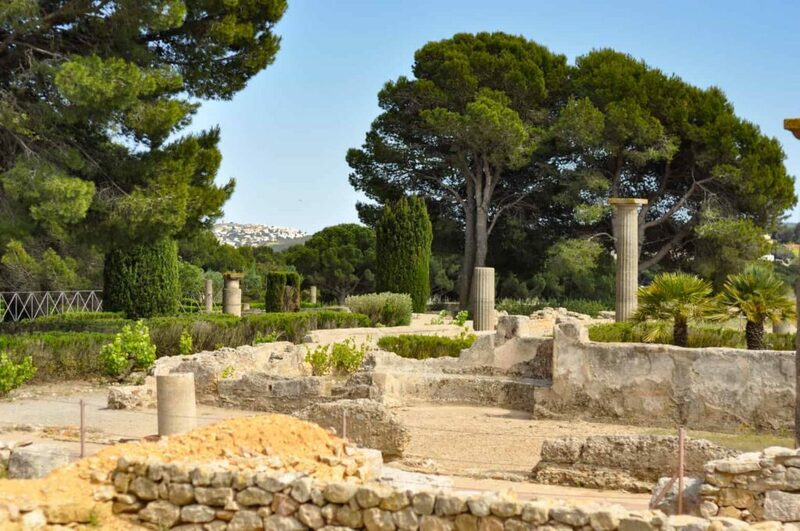 When we first stumbled on the Ruins of Empuries, it was like stepping back into Knossos in Crete. These much less famous Greek and Roman ruins are located near the pretty beachside village of L’Escala. The low key entrance contradicts the size and scale of the treasures within. Founded by the Greeks in the 6th century BC, the ancient town was later occupied by the Romans. It was abandoned in the 3rd century AD and nature took its course. Sand devoured the city and it was only uncovered centuries later, in 1908. Excavation work continues to this day. It’s a moving experience, walking between the old walls and columns, reflecting on what life was like in ancient times. Take time to admire the Roman mosaic floors and sit in silence in the grand amphitheatre. The onsite Archeology Museum is a must-do while you’re there too. While you’re in the area, be sure to check out the Alt Emporda wine region which was named after Empuries. The drive to the Ruins of Empuries takes a little over an hour and a half and passes by Girona. Taking the bus to the Ruins of Empuries can be done, but it requires changing buses in Figueres or Girona, and the whole journey will set you back over 3 hours. Alternatively, a tour will get you there – but for a shorter length of time, as it also showcases other highlights of the region. Check the tour options here. Montserrat mountain is as distinctive as it is imposing – rising up to 1,236 m at it’s highest peak. 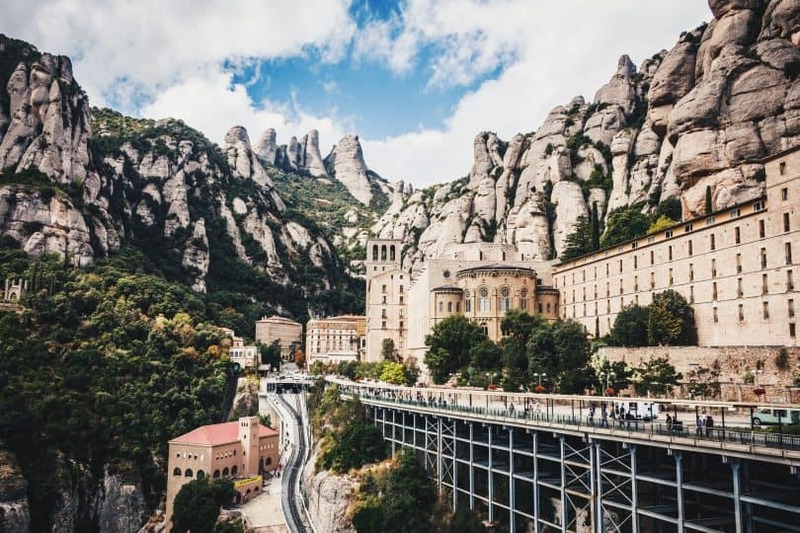 The mountain lives up to its name (Montserrat translates to “saw mountain” in Catalan) with its jagged rock formations creating the appearance of a giant serrated handsaw. The mountain has been shaped over time by wind and water, creating the unique formations you see today. Montserrat is a popular place for hiking and there are trails for most levels of fitness. Take the funicular and explore the mountain at your leisure. 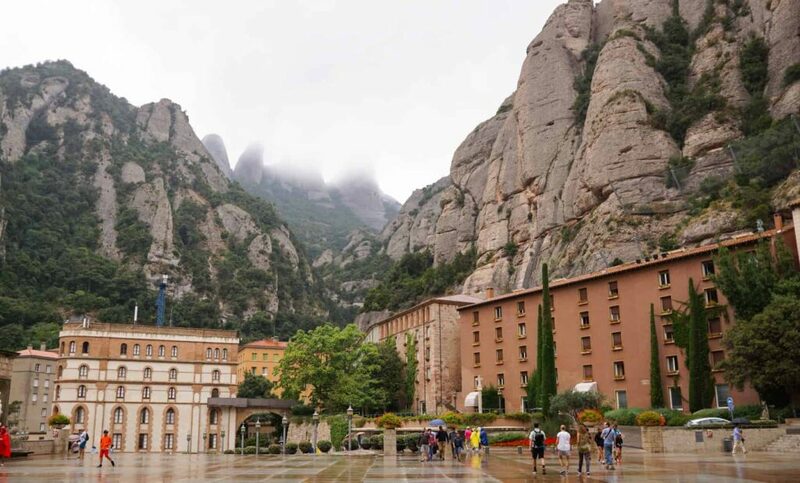 A little more than halfway up the mountain rests the Santa Maria de Montserrat Abbey. A sacred place, and home to the Virgin Mary of Montserrat (also known as the Black Madonna). Hoards of pilgrims descend on the monastery every year, but you don’t have to be religious to appreciate the beauty of the buildings. Trains to Montserrat from Barcelona leave from the Espanya rail station. Look for the Line R5 headed towards Manresa. You can buy train tickets at the station, and you also have the option to buy tickets here for the cable car up to the monastery also. Driving to Montserrat from Barcelona is fairly straightforward and takes around an hour. You can either park at the bottom of the mountain and take the cable car or rack railway up the mountainside, or drive directly to the monastery. There is a large carpark next to both the cable car and the rack railway stations. The stunning seaside town of Tossa de Mar is a must-do day trip from Barcelona. 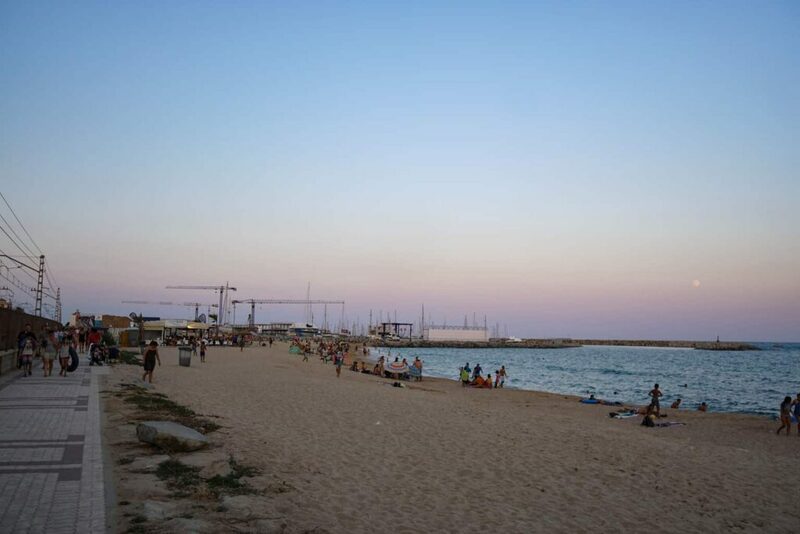 Stroll through the charming network of cobbled streets until you find the pièce de résistance, the vast pale sand beach known as Platja Gran. It’s one of many beaches in the area, and where most visitors end up sunning themselves. The other beaches are a little harder to reach but worth the effort. And all the beaches are amazing for swimming and snorkelling. 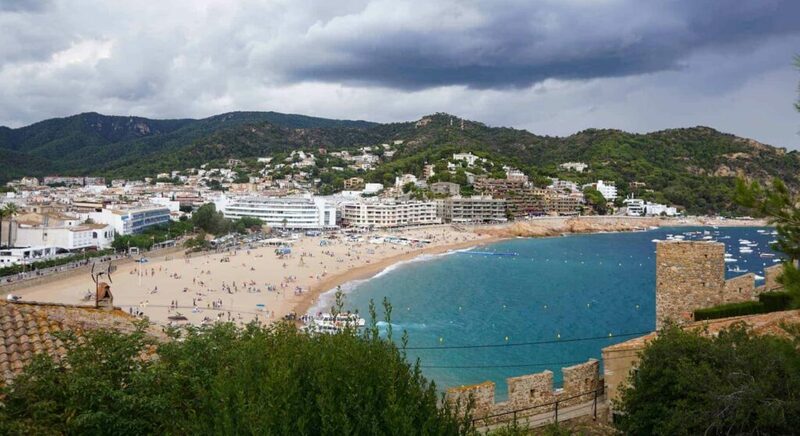 Platja Gran is framed on one side by La Vila Vella Castle – you can’t miss it! The medieval walled town of Vila Vella is an enchanting place to discover by foot. Walk around the old town walls, and admire the breathtaking view from the top. If you get tired from the walk up, or if you’re travelling with kids, you can take the tourist train back down – and enjoy a short tour of the town while you’re at it! If you’ve got a car, the route to Tossa de Mar is fairly straight-forward, just follow the coast! During peak times this road can get busy though, and you’ll save a bit of time if you take the longer but fast E-15 (tolls apply). For those needing to take public transport, the train doesn’t go all the way into Tossa de Mar, so your best bet is the bus which takes around 2 hours ( as opposed to around 1 hour 20 to drive). Or even simpler, book a tour from Barcelona! 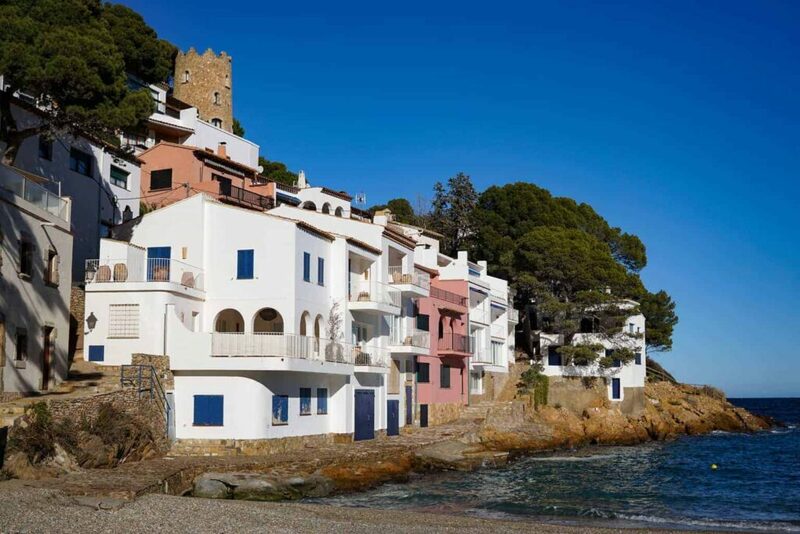 One of the most convenient day trips from Barcelona is the beachside town of Premia de Mar. This old seaside town manages to hold onto the charm of yesteryear, while seemingly embracing the grungy culture of today. A short train ride from Barcelona will deposit you right at the beach – a beautiful long stretch of white sand with safe areas for swimming. When it’s time for lunch, just pop up to one of the beach bars or walk a little further to the marina where you’ll find amazing sushi at Offu Sushi Bar. At night the locals congregate in cafes and bars until late, children play in the squares and music floats in the air. It’s the authentic Catalan experience, that has apparently been overlooked by tourism. Getting to Premià de Mar from Barcelona is a piece of cake. You can drive there in under an hour, or take the train which takes a smidge more than half an hour! Trains depart frequently from Barcelona and deposit you right by the beach. You’ve likely already seen photos of Girona, even if you don’t realise it. 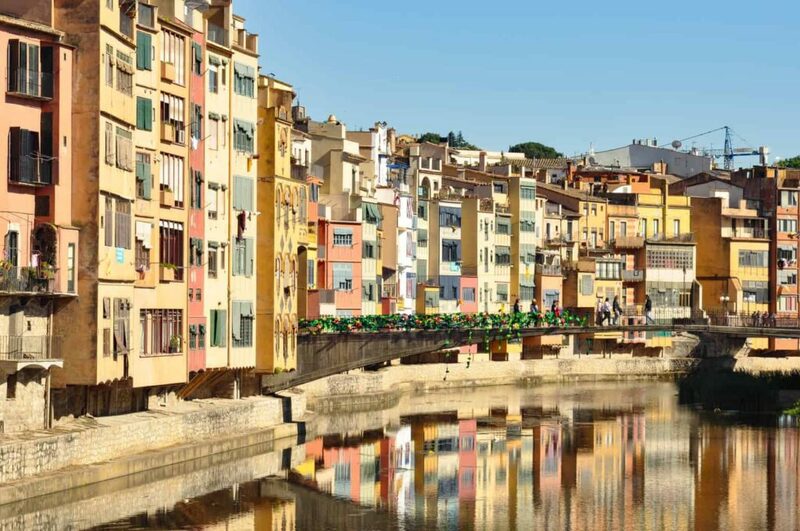 The colourful houses that line each side of the Onyar River adorn postcards and photo albums in every corner of the world. The charm of Girona extends beyond this idyllic scene though. The old town centre is rustic and enchanting, with new discoveries at every turn. Be sure to wander the Jewish Quarter, which has been lovingly preserved. Walk the medieval city walls for a fresh perspective, and pay a visit to the Arab baths. Consider visiting the city in May when the annual flower festival (Temps de Flors) takes place. The week-long festival has been running since 1954 and continues to get bigger and better with every year. It’s a unique and fun way to get to know the city’s attractions as you walk from one installation to another, stopping to take in the incredible displays of floral art. Getting from Barcelona to Girona is a fairly easy exercise and you have plenty of options also! Driving is the most flexible option. Just take the A7 from Barcelona to Girona. It’ll take you about an hour and 20 minutes to reach Girona by car. Trains run frequently from Barcelona to Girona and it’s a much quicker way to transfer between cities than driving. The train will drop you in Girona in around 40 mins. Buses also do the route to Girona, but are less frequent than trains and take longer. 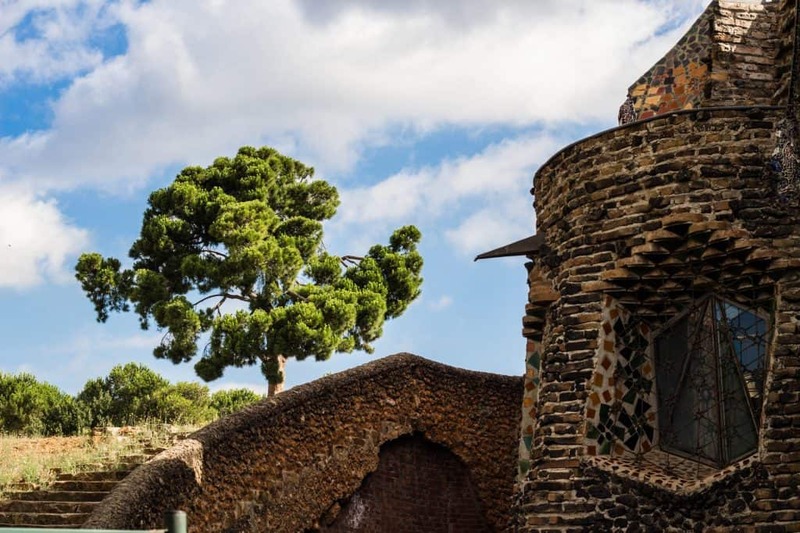 A fascinating place to visit, Colònia Güell is just a quick drive from Barcelona, making it an excellent choice for a short day trip (if you were pushed for time you could even combine it with a trip to Montserrat). The purpose-built industrial village was founded in 1980 by Eusebi Güell who moved his textile mill to the area. He commissioned Antoni Gaudí to build the colony’s church, but Gaudí only got as far as completing the crypt before the plan became undone. While Gaudí didn’t get to realise his project, it still serves as a working church and it stands as a remarkable insight into the artist’s plan for la Sagrada Família. The crypt became a UNESCO site in 2005. Nearby, you can see the abandoned factory workers’ houses and castle ruins. Driving to Colònia Güell and Gaudí’s Crypt takes around half an hour from Barcelona city centre. Taking the train takes roughly the same amount of time. Take train lines S33, S8 and S4 and get off at Colonia Güell station. 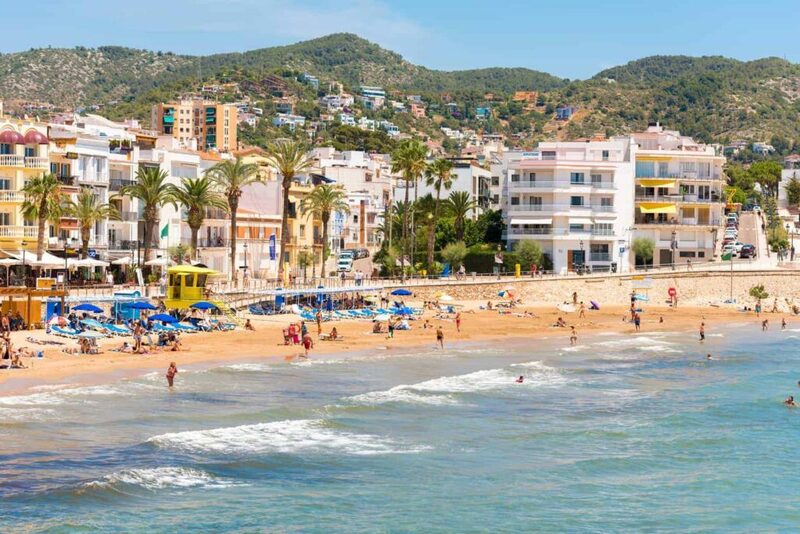 With its proximity to Barcelona and prime seaside position, you’d be forgiven for thinking Sitges was just like any other beachside town running the length of Spain’s northwestern coast. But you’d be wrong. The town’s manicured feel and cosmopolitan vibe aren’t manufactured, they’re the result of Sitges being the top spot for rich Barcelonians’ holiday homes for centuries. It’s no hidden gem though, during the summer months the population quadruples. And in Autumn, horror and fantasy film lovers flock to Sitges for the International Film Festival. Alongside the traditional charm, you’ll find free-spirited values. 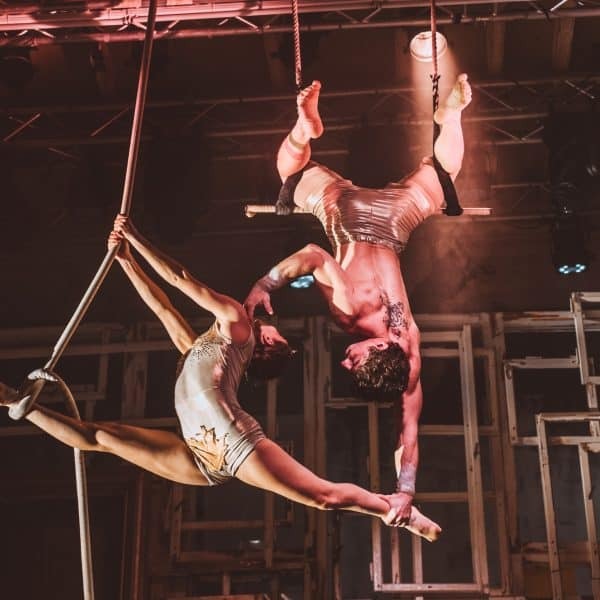 There’s an underlying bohemian vibe, and it’s a welcoming haven for the gay population – with several events held throughout the year. It takes just under an hour to drive to Sitges from Barcelona. Take the C-32 southbound. Or ditch the car in favour of the train which will get you there in around half the time! Trains run frequently from Barcelona to Sitges – look out for the R2S line. Buses also run between Barcelona and Sitges and take around 45 mins to reach their destination. Check the MonBus website for timetables. Most famous for its Roman remains, Tarragona is a very popular day trip from Barcelona. Founded in 218BC, Tarragona showcases artefacts from throughout its turbulent history. From the waterfront amphitheatre to the Monumento a los Castellers, Tarragona packs a hefty dose of culture. There are plenty of things to do and see in Tarragona. 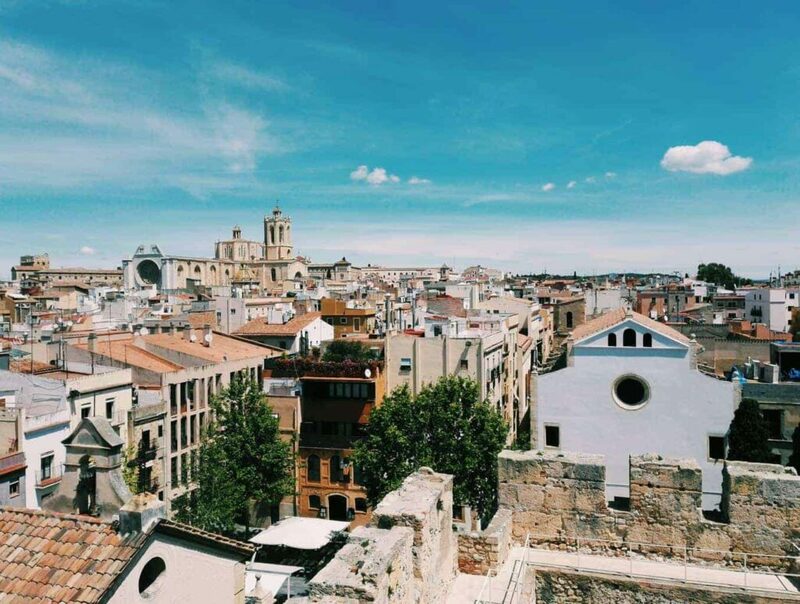 Explore the old city with its labyrinth of alleyways and discover the city’s own version of La Rambla – a more authentic version of its northern counterpart. 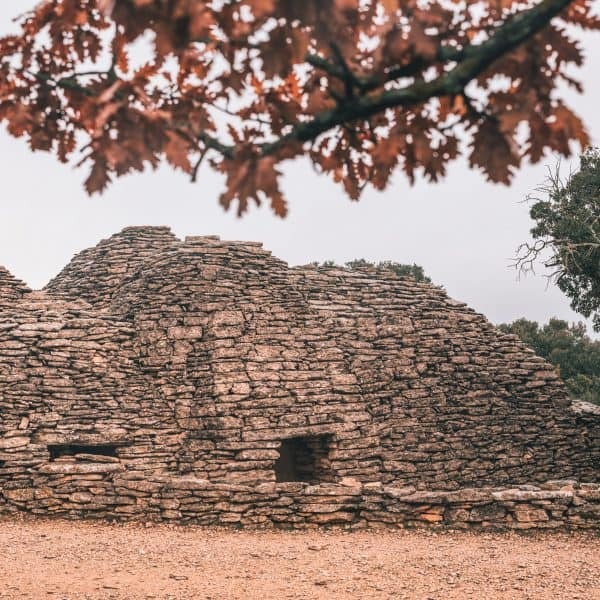 The National Archaeological Museum of Tarragona will take you on a journey through time, and when you’re done exploring you can wander through the Parc de l’amphithéatre to the golden sandy shore beyond. To visit Tarragona as a day trip, taking the train is your best bet. Trains run frequently, and the high-speed service will deliver you city to city in only half an hour! Driving, on the other hand, will take you almost three times as long – without the potential traffic holdups! You can also jump on a bus, but I’m not sure why you’d pick this option when it takes around 1.5 hours each way. 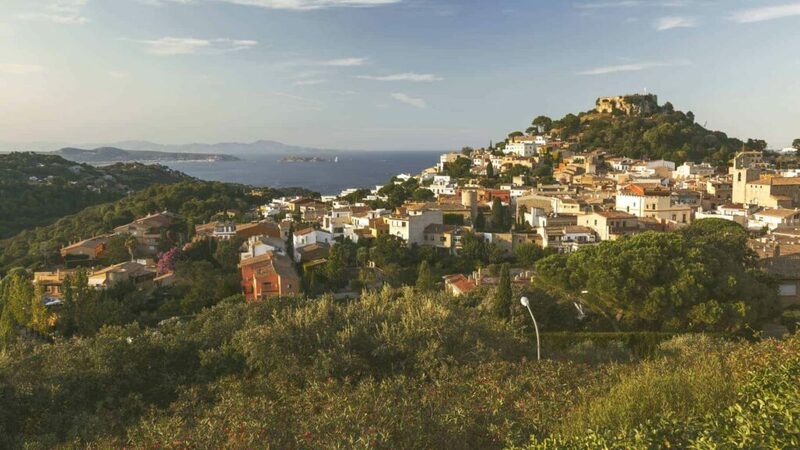 When visiting Begur you may feel as if something is different, there is a unique flavour to this off-the-beaten-track town. I didn’t find out until after our second visit that Begur has ties to Cuba, and many of the colonial houses here were built by Begurencs who had returned from the Caribbean with spare change in their pockets. It’s a lovely place to discover at leisure, as you entertain fantasies of buying our own holiday house. At the top of the village, you will find the crumbling Begur castle. The Castle dates back to the 11th century, but now only the foundations remain. Nevertheless, it’s a lovely place for a walk and you’ll be rewarded with some of the best views in the region. Nearby Begur, you’ll also find plenty of the region’s finest beaches, including all but one (Cala Fonda) of my favourite beaches listed below. To drive to Begur from Barcelona, take the A7 towards Girona, then merge onto the C35 towards Begur. Driving takes approximately an hour and a half, more if there’s traffic. Alternatively, buses cost around €20 and take 2 and a half hours to reach Begur. This one is for anyone with kids or anyone who loves behaving like one! PortAventura is actually made up of three different theme parks, earning it the title of the largest theme park in Spain. There’s PortAventura Park with its thrilling rides, entertaining shows and even world’s within a world. 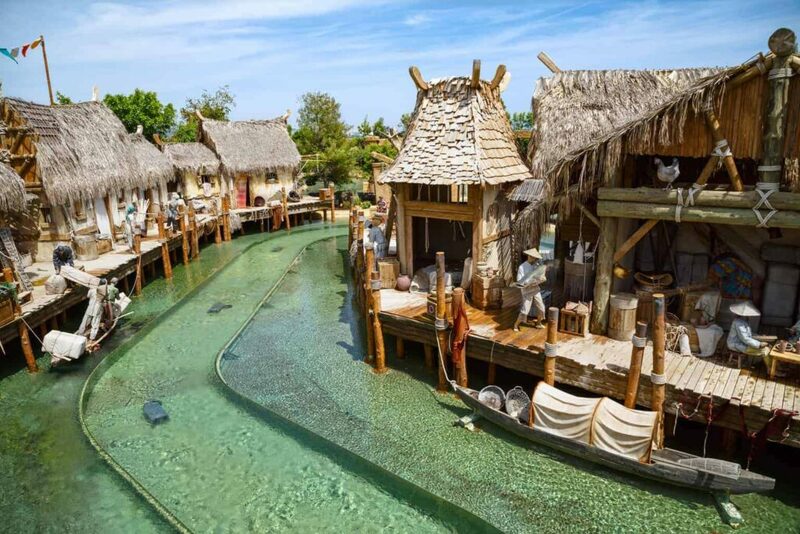 You can visit Polynesia, China and Mexico without stepping foot outside of the park! Then there’s the aquatic park – perfect for cooling off in summer or indulging your love of water slides. It even has its own beach, complete with lapping waves. Ferrari Land is the latest addition and adds an Italian thrill to the park, complete with a replica Colosseum! Ferrari Land is for lovers of speed and is home to Europe’s highest and fastest rollercoaster. Drive, bus, train – all roads lead to PortAventura. It’s an easy hour and a half drive from Barcelona, or take a leisurely ride on the train for roughly the same length of time. See the train information here. The bus takes slightly longer, at around 1 hour 45 mins. See the bus timetable here. A town of museums, Figueres has a lot to offer the visitor who wants to explore Catalonia beyond the beaches. 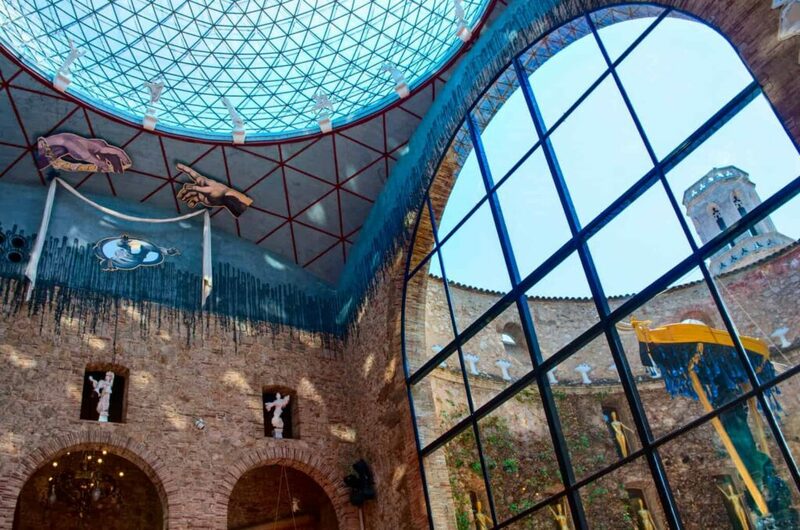 The most famous attraction in Figueres is the Dalí Theatre and Museum. A museum dedicated to, and created by, Salvador Dalí in the town where he was born. The Dalí Theatre and Museum is a truly unique space, with the works on display carefully curated by the artist himself. Dalí himself was even buried in the museum in 1989, his body lays in a crypt below the stage floor. Other museums include the kids favourite Museu del Joguet de Catalunya (toy museum), the Museu de la Tecnica de l’Emporda (technology museum) and the Emporda Museum (cultural museum). 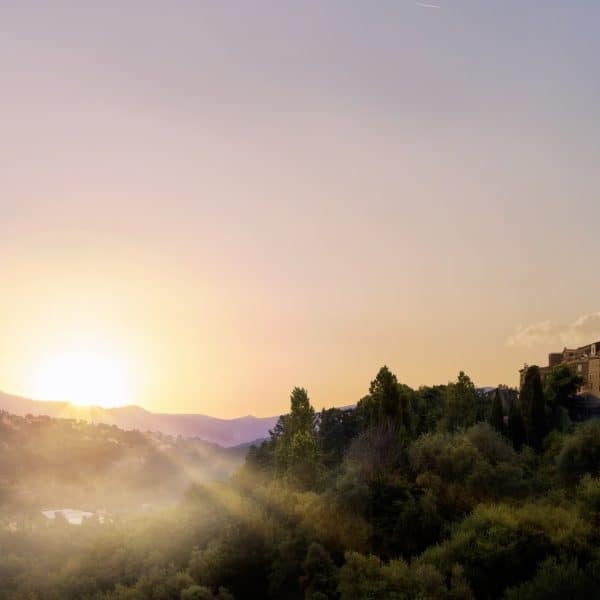 The town’s 18th-century fortress, Castell de Sant Ferran is also worth a spot on your itinerary. Once again, taking the train or driving are your two best bets for visiting Figueres as a day trip from Barcelona. Both take about the same length of time, but driving could end up costing you more when you factor in tolls and petrol costs. 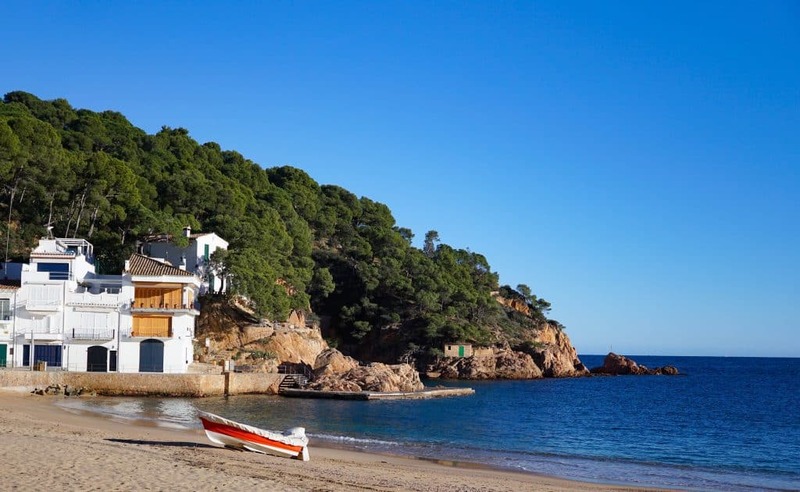 Aiguablava is a picture-perfect beach located near Begur on the Costa Brava. The turquoise water is shallow and calm, making it a great beach for younger swimmers. You can even watch older kids splash around on the shore while enjoying a cool drink at one of the beach bars. It’s a popular spot in summer for anyone wanting a cool dip in the sea, or to go kayaking and paddleboarding. The beach at Tamariu is one of my favourite on the Costa Brava. Another family-friendly beach, it’s popular, but not yet overridden by tourism. It used to be a fishing village, and colourful dinghies can still be found resting in the sand. It’s large enough not to be crowded, and because it’s not reliant on tourism, you can still dine the beachside cafe’s in the heart of winter. Platja Fonda is one of those beaches the locals would rather you didn’t know about. Tucked between rocky cliffs, it’s the perfect place to find a little tranquillity during the busiest months. The sand is darker and grittier than other beaches nearby, but with that comes the advantage of not getting it stuck to everything! The darker shade of sand also gives the water a unique teal colour, making it even more inviting. This beach is not ideal for families, as you must walk down around 100 steps to access it. Sa Tuna is a hidden oasis near Begur. It still has the lovely, authentic village feeling that is missing from some other beach resorts on this stretch of coast. The steep hillside that surrounds it doesn’t allow for overdevelopment. It’s a lovely place to visit in any season. In summer, it has a more lived in feeling, but come winter you can wander the charming laneways entirely undisturbed. The beach is small and picturesque, and you can walk the coastal pathway, past the candy-coloured houses, to nearby Cala de Aiguafreda. Known as Waikiki beach to the locals, Cala Fonda is a stunning white sand oasis among the lush green bush and burnt orange cliffs that surround it. It’s located near Tarragona and is a little tricky to get to, but that makes the reward all the more enjoyable! And it’s this remoteness that means it can be a lot quieter than some other beaches along the Costa Brava. There are no facilities at Cala Fonda, which adds to its charm, but also means you need to come prepared. Bring water & food, sunscreen & towels, and a good book – then you’re set for the day! Relax into the serene scenery and experience the true magic of the Meditteranean. Wow, so there you have it! When I started writing this post it was going to be the ten best day trips from Barcelona but that number quickly grew as I realised how many great places we’ve visited in close proximity to the city. Catalonia is so rich in natural beauty, colourful culture and fascinating heritage, it’d be a shame to only see a small part of it. I hope you find this guide helpful in planning your next Barcelona holiday!